Kreg is known for making reliable clamping, joining, and cutting tools. The company prides itself on the precision and quality of their tools. It’s not surprising that the Kreg Rip-cut Circular Saw Edge Guide meets expectations, and perhaps exceeds them. This handy universal circular saw attachment is designed to create accurate, straight, and repeatable cuts up to 24 inches wide. Simply clamp it into place, set it to the desired width, and then rip those big plywood sheets into pieces as desired. The Kreg KMA2675 features three major components. These are the rail, which has useful measurement markings, the sled, which attaches to the saw, and the handle slot. Both the rail and the edge guide are reversible, allowing for left or right-handed use. This is basically a higher capacity and greater functional version of a rip fence. As you might imagine, it expands the saw’s usefulness. There is a filler strip on the sled, which is used to accommodate saws with either angled or flat leading edges. You can simply pop it out with a screwdriver and flip it over. The base plate clamps are used to secure the saw and the sled together. If you get Kreg’s Accu-Cut the sled will also act as its foundation. The cursor is a piece made of clear plastic with a red strip on it. This is used to help orient the rail and its measurement marking to the cutline of the saw blade, enhancing accuracy. This feature is very helpful for ensuring that everything works together, producing repeatable straight cuts. The final component for the Kreg rip-cut is the indexing stop. This marks the saw’s position on the sled so that you can remove and replace it without having to take time for reindexing or recalibration. How Does the Kreg Rip-Cut Circular Saw Guide Perform? The Kreg Rip-Cut circular saw guide is user-friendly – and that’s one of the best things about it. Here’s how it works. You can literally have this product put together in 45 seconds once it has been removed from the packaging. The edge guide and the rail are screwed together with just two screws. You then orient the filler strip in the sled in order to set it to cut angled or flat edges. Then you install the cursor and remove the indexing stop. After that, you set the base claps and tighten down the screws against the shoe of the saw. Next, you put the indexing stop back and put the sled onto the rail. After the cursor has been attached, it’s time to line up the cutline with its measurement markings. In order to line it up, you need to first lift up the blade guard. Then you slide the sled so that the blade makes contact with the edge guide. Now you should see that the red line on the cursor covers the line on the rail. Now that this has been done you can determine the length of your cuts without having to use a tape measure. In the beginning, you might find that it can be a bit awkward getting used to a new device being connected to your saw. The connection isn’t flimsy, but you should still take care as you may bend the rail if there is too much force applied. The manufacturer recommends that you take care when setting it down, as it is possible for damage to occur. 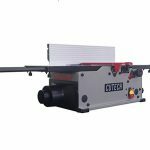 Beyond that, you are able to operate your saw with one hand and manage the edge guide via its large handle with the other hand. This user-friendly feature provides you with increased control of your cuts. Simply set the rail onto the workpiece and then push the edge guide into the edge of it. Then you need to move the sled along the rail until you achieve the desired width. Check the cursor for accurate measurement. Once you have everything set, lock in the sled with the gray clamp. While this accessory is well-built, it’s possible to create weak points by accidentally over-tightening the screws that hold the clamps in place. You want to be careful with this as overtightening can cause the clamps to push out from the sled. While the sled is made from a polymer that is resistant to impact, either under tightening or over tightening can cause the connections to fail. 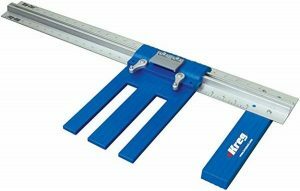 Just like any other tool in the shop, the Kreg Saw Guide can make quite a difference, particularly if you tend to rip plywood on a regular basis. It’s an inexpensive and helpful accessory that can increase accuracy and eliminate frustration while helping you save time on projects of all kinds. Is this tool worth the investment? We think so!